BIT.GAME is the world’s first digital asset exchange for blockchain games, it will not only grow together with all the members but also share benefits through PoC Mining Pool and Double Repurchase Program with global game players as well as exchange users. BIT.GAME provides an original and complete set of development kits for traditional game publishers based upon Ethereum, Achain, TrustNote, Gamechain System, and Matrix AI Network etc. BIT.GAME Solution contains Off-Chain Circulation Solution, Single-Public Blockchain Solution and Multi-Public Blockchain Solution. BIT.GAME Platform is based on DAICOs, and it offers technical support, incubation funds and asset trading for all the innovative, high-potential blockchain game projects. 1. What is the SDK or abstraction layer based on? Restful API. 2. What’s the formula for the Mining. All the games produced by BIT.GAME will support mining function. Users are able to mine BGX in games which have integrated with BIT.GAME mining SDK according to PoC program. Also, all parties in the token transaction procedure, such as regular users (buy/sell), agents, project partners and market makers, will acquire BGX according to the volume they contribute to the exchange as well. 3. What’s the formula for the exchange dividends? Through our Double Repurchase Program. BIT.GAME will take out 50% of the net income of annual commission fees (excluding costs) to repurchase BGX tokens and burn them until the remaining quantity of circulation is 5 billion, ensuring that repurchase details are public and transparent. After the Stage One, BIT.GAME will continuously take out 30% of annual commission fees (excluding costs) to repurchase BGX tokens, ensuring that repurchase details are public and transparent. Obtained BGX will be supplemented into the mining pool to ensure that the mining output is reasonable. 4. How does earning from trading work? Through our PoC Mining System. Exchange users are able to mine tokens through trading/mining procedure. Meanwhile, we keep increasing token values by Double Repurchase Program. Thus, during the development of our Exchange, users from early stages will all be able to obtain profitable benefits from every transaction through mining BGX. 5. 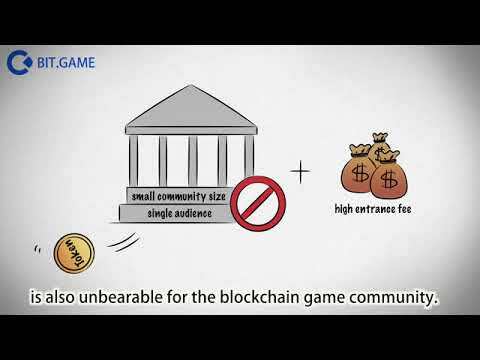 What’s the size of the funds for blockchain games. In order to boost the development of blockchain game industry altogether, BIT.GAME will establish Blockchain Game Investment Fund jointly with Matrix AI Network, Elastos, TrustNote, Achain. We’ll take out 500 million BGX as part of the fund for the first phase and will make further plans according to the input and output condition afterwards. On May 26th, we will hold a press conference in Beijing to announce a plan of Blockchain Game Competition in full details with $1.5 million as total rewards, this is also part of our plan of funding activities. Certainly not. We issue 10 billion tokens altogether, but we’ll keep spending money to repurchase tokens in 2 stages and burn them to keep increasing the value of tokens. In stage 1, the circulation will be 5 billion tokens left, and in stage 2, it will be even less. 7. How many games on launch? When is launch? We are cooperating with about 30 game developers right now to develop blockchain games integrated with our BIT.GAME Solution, as you could also find the progress in our daily and monthly report released in our media accounts as well as in telegram group. We are going to release some information of the blockchain games in our official website by May and release some codes & demo of them in our Github by June. 8. How much bonus did private sale get? Private Sale is finished during Jan. to Feb. this year. At that time the raise price for 1 BGX was about 0.004$~0.005$, without any bonus. 9. When is ETH pegged on our investment? 10. Token Economics, token value. There are several aspects that members could do with BGX. a. Since we have our own BIT.GAME Exchange, BGX will certainly be used to vote for whichever game projects they like, just like voting with HT, OKB and BNB in their platforms. b. Since we have this Double Repurchase Program, we actually spend quite a sum to keep repurchasing BGX (just as I mentioned above) to increase the token value, so that members will also share the benefits of us. c. We’ll take 30% of total tokens to put into PoC mining pool for all players to mine tokens thus to earn more tokens. d. We’ll also offer locking up plan for all the members with incentive thus to help increase the value as well. 11. liquidity of your token after ico. BGX will be listed in BIT.GAME Exchange first and will be put into market for liquidity. At the same time, we’ll also cooperate with 2 or 3 comprehensive exchanges with strategic plans. BGX would be taken as the representative of blockchain game ecosystem to be used for transactions in their exchanges. 12. If there is any game project that is not going well, will it affect our BIT.GAME Exchange and BGX? Nope. First, all the game projects would be authorized by us before we listing their tokens in our exchange to make sure the projects are good ones. Then, we'll demand all the game projects as a must to provide their data and information all the time simutaneously, so that all members are able to check all the projects and have their own adjustments. lastly, even though there is some force majeure that happens such as serious bugs or hacks, there's a reserved fund already (as u could also check in our Whitepaper for token distribution part) to protect all investors' benefits in our exchange. - No product; errors on the website "BIT.GAME is the worldâ€™s first digital asset exchange for blockchain games"